as it closed. Tangent / I found out once a driver gave me 4 stars because he said I slammed his car door. Now, I’m always freaky cautious about it. /tangent. Anyhoo, I tried to catch the door mid-close and naturally my thumb caught the fall-out. It was all swollen and bruised for about a week. The first few days were agonizing. By day 4, the pain had settled into a dull throb. Ice and heat combos helped a little but I had to resort to hydrocodone a few times. Yeah, it hurt that bad! I’m told I have a high threshold for pain usually. I whined like a little boy for a couple days, I don’t mind telling you. On a side note, I am totes sure I looked super hot and totes masc sitting in an political endorsement meeting with my thumb shoved in a glass of ice the whole time. So now you know, folks. 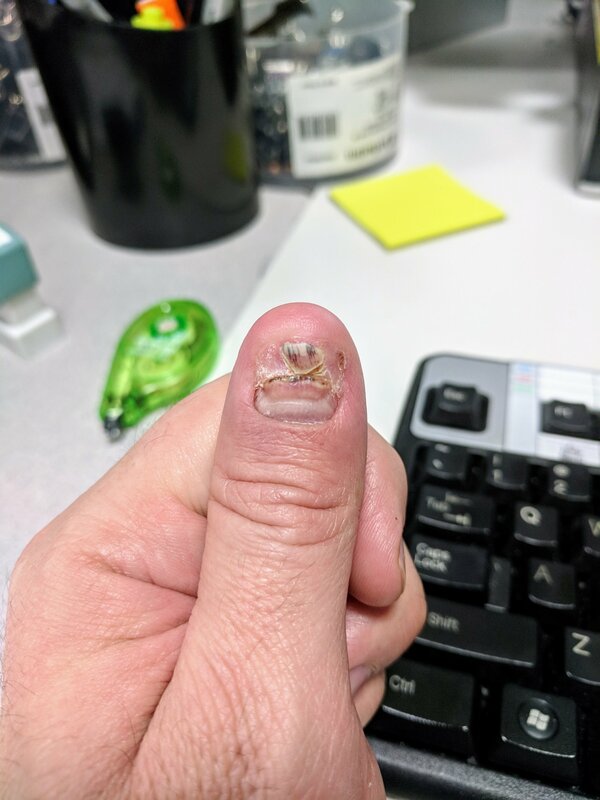 My exciting world of a damaged thumb.